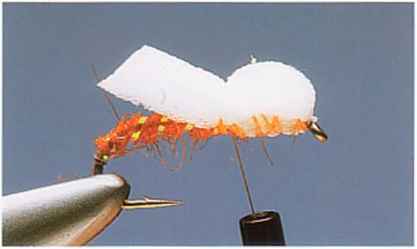 Plastic microcellular foam is one of the great successes of '^f modern fly-tying. Being buoyant and extremely tough, it is ^trout" Perfect for creating a whole range of dry flies and emerger patterns. 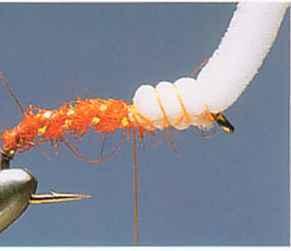 The key to using foam is judging the amount needed— as little as possible, so that the fly still floats but bulk is kept to a Rainbow minimum. In this pattern, a small strip of foam is folded over to form a buoyant thorax. In this way, the Suspender Buzzer, which imitates a small, hatching midge, sits with only its thorax floating in the surface film, just like the real thing. Here, white foam colored with a permanent marker has been used, but other colored foams work equally well. 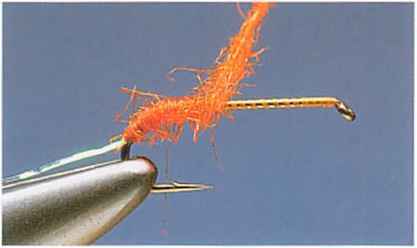 IFix the hook in the vise and run on the tying ^ Take a pinch of orange seal fur and offer it up thread. 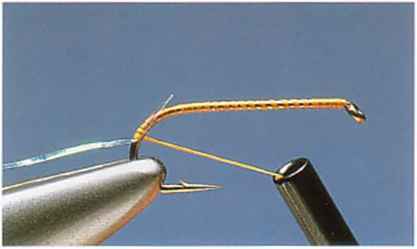 Carry the thread around the hook bend ^ to waxed tying thread. Dub the fur to form a and catch in 2 inches (5cm) of fine, pearl Lurex. 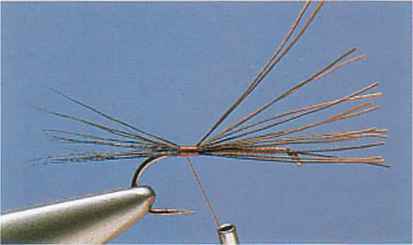 thin rope and start to wind it along the hook shank. 3 Stop the fur two-thirds of the way toward the eye. The aim is to create a slim, tapered body. Wind the Lurex over the fur in evenly spaced turns. Secure and remove the excess Lurex. 4 From a sheet of foam, cut a strip 2 inches (5cm) long and X inch (0.5cm) wide. Catch it in so that the waste end runs from the eye to the start of the body. Secure the waste end with thread. 5 Fold the foam gently back to the eye. Don't stretch it tight as this will flatten the foam and reduce its buoyancy. To secure, use loose thread wraps that won't compress the foam. 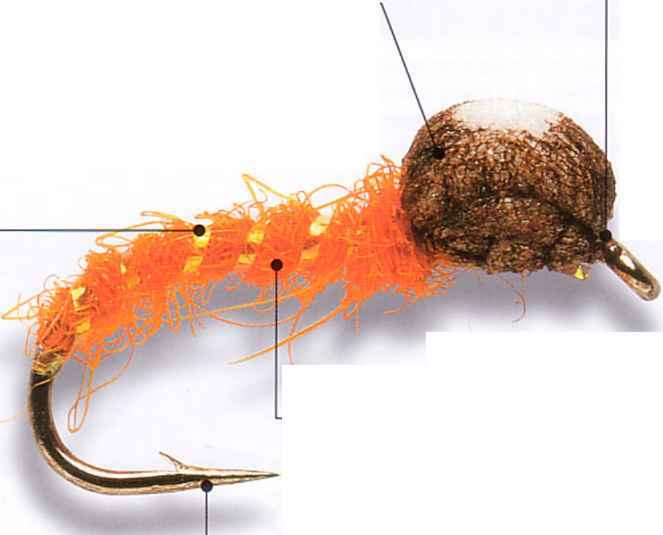 6 With the tying thread positioned in front of the body, fold the foam back again and secure in one place. Cast off the thread, trim off the waste foam, and color with a felt-tip pen.